We obviously had some leftover chicken from our BBQ Chicken recipe yesterday. Chicken Legs decided that we needed to make Chicken and Waffles. I used my Mom's favorite waffle recipe. The waffles tasted great and were really light and fluffy. They were really good with the BBQ chicken and would be fantastic for breakfast. We tossed the leftover chicken with some of extra BBQ rub and put a big scoop on top of the waffles. 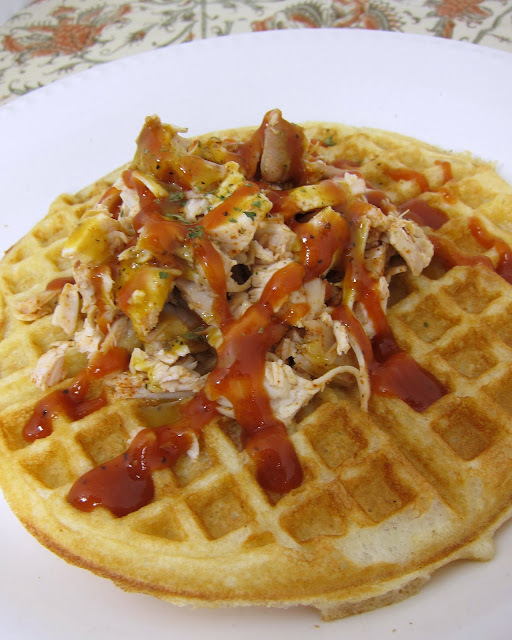 We drizzled the chicken and waffles with two kinds of BBQ sauce - the honey mustard BBQ sauce from yesterday's post and our favorite red BBQ sauce. Delicious! Sift dry ingredients together. Combine yolks, buttermilk and oil. Stir into dry ingredients. Fold in egg whites, leaving a few fluffs. Bake according to waffle maker directions. Wow. I've never thought to put chicken and waffles together. They look yummo. I've never tried this combination but it looks delicious. Your photos are good enough to eat too. This is something that you never get in Canada but is so fantastic. What a great idea for leftover chicken. One of the other food blogs already had me craving waffles...you've just sent me over the edge of really wanting them now. 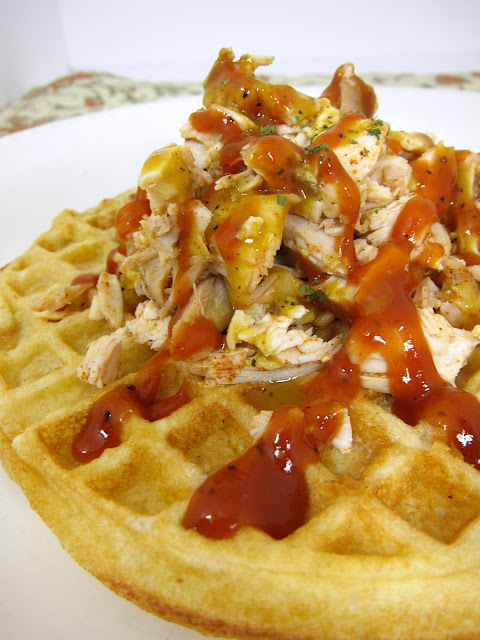 I have never had chicken and waffles, which seems a shame. Yours looks delicious.